Claudius could have found quite a few of them living near Lovewell where Samuel Henry Switzer and his wife Anna Elizabeth (Statler) settled at the start of the 20th century. Born in 1850 in Fulton County, Illinois, Samuel was the firstborn child of Jacob Henry and Mary Ann (Haffner) Switzer who came to Illinois from Virginia. Most of Samuel and Anna’s children were also born in Fulton County, although the two youngest were born near Beatrice where the family moved in the late 1890’s. Samuel Henry and Anna Elizabeth Switzer became the last of my great-grandparents to converge on the hamlet of Lovewell, arriving in time to lay Samuel to rest in Fairview Cemetery in 1906. He was fifty-six. By then Samuel was the father of fourteen living children, only two of the couple’s offspring having died in infancy. The surviving children, many of whom came with their parents to Lovewell, were Bertie, Jess, Nora, Silas, Orvel, Norvel, Mae, Jacob, Lulu, Minnie, Charles, Benjamin, Effie, and Lily Bell. Forty students attended Sinclair Rural High School in 1937, the year my father graduated. Most of the area's family names were represented by one student each. However in that one school year there were two Vestals, two Heldts, two Smieses, and two Swiharts. There were four Switzers, culled from the families of three of Samuel Henry Switzer’s boys. Three of the four Switzers were members of the senior class, pictured to the right. Dale Henry Switzer was the son of Jacob Henry Switzer. Wayne Switzer, the class salutatorian (also voted most ambitious), and his sister Evonne (the girl in white shown in the previous posting “A Class Act”) were children of Orvel Switzer. Wayne was also clearly the senior most delighted about having his picture taken. 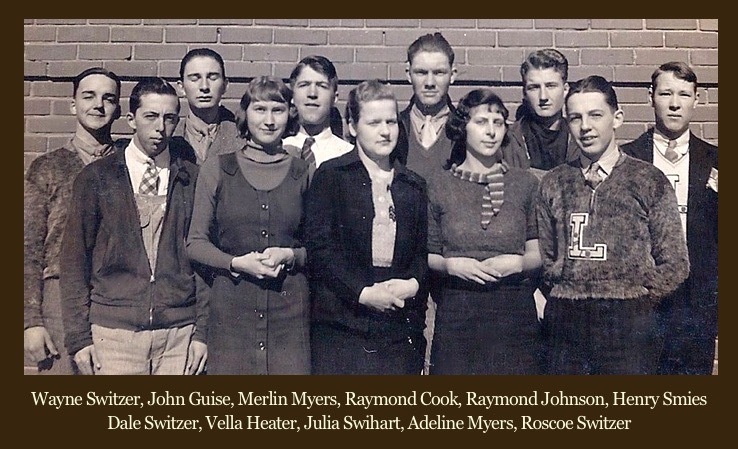 Roscoe Switzer, the lad with the letter “L” on his sweater, was the son of Benjamin Switzer, who, Dave Lovewell tells me, was Jewell County Sheriff for a while, and the subject of a local legend that got blown out of proportion concerning a shooting affray and a delinquent goat. We’ll get around to that one of these days. Except for Wayne the entire back row resembles a group of young toughs who’ve been caught in a police dragnet. I’m not sure how much brushwork was involved, but I have all their senior portraits, and the whole collection exudes high-minded cheerfulness. Complexions have been scrubbed clean and there’s not a hair out of place nor a freckle in sight. A few seem downright angelic. 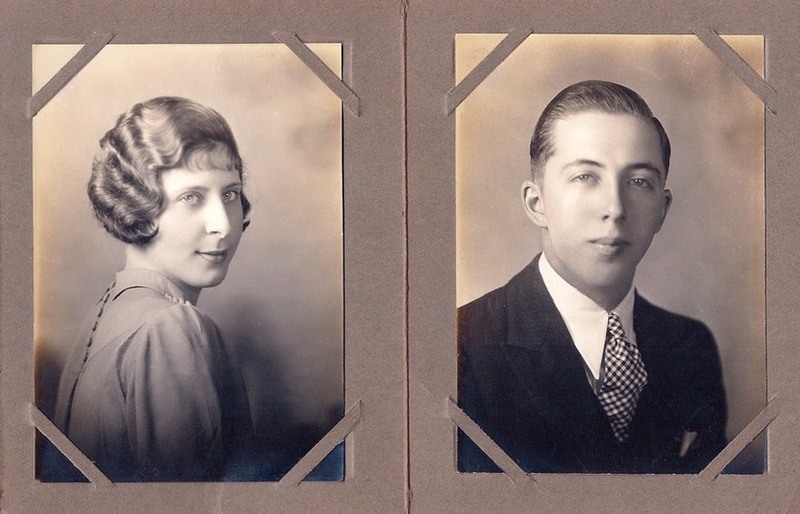 The portraits are in a miniature fold-out album, and the facing pictures of my dad and Adeline Myers showcase the craftsmanship of portrait artists in 1937. Dramatic lighting sculpts facial structure with delicate shadows, luminous eyes sparkle with reflected accents, subjects are posed with their torsos at an angle to the camera, throwing their shoulders into a soft blur, the viewer’s attention tightly focused by shallow depth of field. It’s work that was influenced by the magicians of Hollywood’s Golden Age, who made Garbo a goddess and Gable the paradigm of American maleness. Most of the farm boys had attended every year of school in bib overalls, but in the album each one looks like a future bank president, and every girl resembles a starlet being showcased in the latest issue of Photoplay. Wayne Switzer, so help me, looks exactly like a very young F. Scott Fitzgerald. Seeing what the camera could be coaxed into doing for him and his classmates, may have been what led him to pursue a career in portrait photography. He was quite successful at it.